Today started very early. We woke up at 5 AM so we could catch the bus to the train at 6:15. From Cusco it was a train ride of a little over four hours. The start of the train ride was interesting because we had to go through a series of "switchbacks". With Cusco being located in a valley surrounded by mountains too steep for the train to climb strait up, the train has to zig zag back and forth to get to the top. At each "switchback" the train reverses direction and switches to a different set of tracks. Once we got over the mountain the rest of the trip was all down hill. Once we arrived in Machu Picchu our tour guide quickly guided us through the market at the railway station to a bus to take us up to Machu Pechu. The bus travels up a very steep windy road to an area just below the ruins where there is a small snack shop and a hotel with a restaurant. There was a little confusion when we arrived because our guide had told us we would be having lunch when we arrived, which was different than what we were told by the tour operator. It turned out our guide was wrong. Since I knew we wouldn't be eating for a while I ate one of my Zone bars so I wouldn't be hungry during our trek. 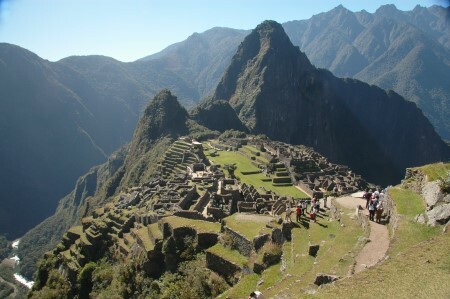 Machu Picchu is an amazing sight. 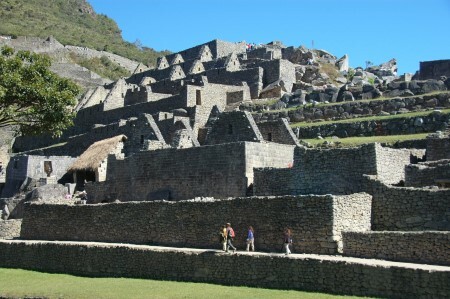 As we entered we could see an enormous city built on the top of the mountain with terraced gardens and huge stone walls. As we walked around we noticed how some walls were built of stones of various size and used mud or mortar to hold them together, while other buildings had the stones carved to precisely fit together as we had seen the day before at Sacsayhuamán. We were also shown a water system with a constant flow of water. 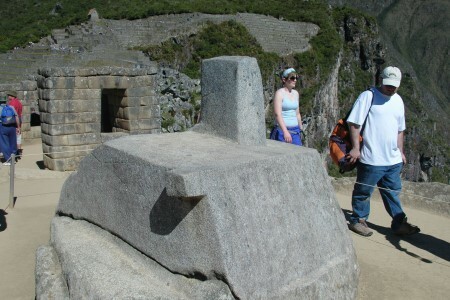 As we kept climbing up further we eventual came upon the Intihuatana Stone which is perfectly aligned with the sun during the winter solstice. 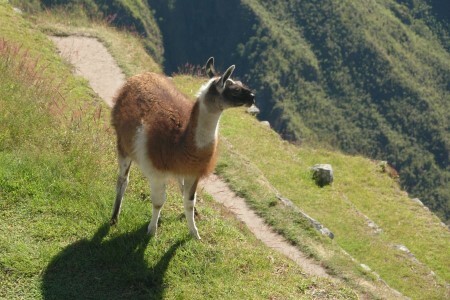 When we finally reached the top not only was there a good view of the whole city, but a llama. The train ride back to Cusco was exhausting. 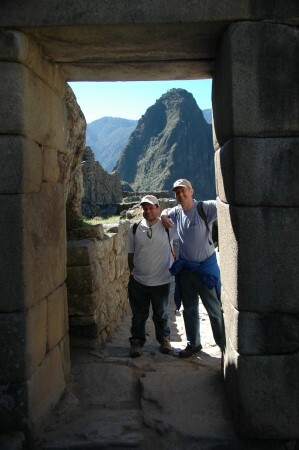 For some reason it seemed much longer than the trip to Machu Picchu. Perhaps it was because we were going up in altitude rather than going down, but everyone was starting to get tired and edgy. Luckily just as we arrived at the stop before Cusco our tour guide jumped up and told us we were taking a 20 minutes bus ride back to the hotel rather than spending another hour on the train. When we got back to the hotel one of the first things we did was turn on the heater since the room was very cold. As soon as I did that the electricity in the entire hotel went out. When the power finally came back on a few minutes later I tried turning the heat on again. After a few seconds, click, there went the lights again. When the lights finally came back on we decided not to try the heater again, but Joel turned on the TV, click, there went the lights. At this point we decided not to turn anything on, but the lights continued to flick on and off over the next few minutes. It was almost comical. Joel and I started making jokes about the clapper and other lights on / light off related jokes.